Hotel KERN is situated in the safe and quite part of Prague, close to its city and historic centre. The rooms are well equipped with conditioners, safe places, hair dryers, WC and shower, WI-FI internet access, satellite programs, telephone and TV. Hotel offers rich buffet breakfasts with the wide range of ham, cheese, muesli, fruits and vegetables. Parking is included in the price of the room. Parking places are in the safe area of the hotel. The Kern Guest House offers comfortable and convenient accommodation in Prague, in a quiet suburb surrounded by a lovely park and situated only ten minutes by car from the centre. This good-value-for-money guest house in Prague has been recently refurbished and offers a very welcoming atmosphere, perfect for spending a memorable holiday in the Czech Republic. Free parking is in the closed area. The Kern Guest House in Prague features airy and spacious single and double rooms, decorated in an elegant style. Accommodation amenities include private bathroom, hairdryer, air conditioning, direct dial phone, mini bar, satellite TV, safe and wireless Internet access. 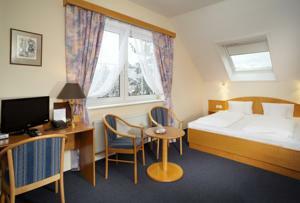 Pension KERN is situated in the quite suburb of Prague, but only 10 minutes from its historical and city centre. a guest can cancel his booking 48 hours before check in, otherwise we are sorry to charge cancellation fee -50% of the whole stay.